Who doesn't love a giveaway?? This one is being offered by the very talented Amanda over at Persistent Green. 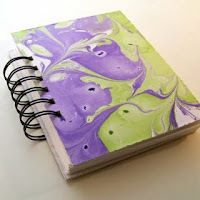 Who wouldn't want to win this gorgeous handmade marbled journal?! Go on over there, look around, visit her awesome Estsy shop, and enter the giveaway. Hurry, because it ends on October 7!! On an entirely different note, I just have to blog about the awesome hamburger that my teen son and I made last night for supper. He saw it on an episode of "Man vs Food" and I decided to try it out. Oh.My.Goodness!! DELICIOUS!! The name of the burger is the Jucy Lucy Cheeseburger, and it was really fun to make. I've included the recipe, so you can make it at your house! (the pic above is from the original article/recipe on ehow.com.) We had already devoured the evidence by the time I came to the realization that I had not snapped a picture! ! DRATS!! Using potato masher, mash bread, milk, garlic powder, salt and pepper in large bowl until smooth. Add beef and gently knead until well combined. Portion into eight even units. Pat until they are a thin round patty that's slightly larger than the cheese slice. Turn the 8 patties into 4 patties by sandwiching a slice of cheese between two individual patties and then pressing tightly around edges to seal. Crimp the edges tightly so that the cheese will not blow out of the hamburger. Preheat a heavy-bottomed pan to medium heat or cook them on your outdoor grill. Note: The burger may puff up due to steam from melting cheese while cooking and this is normal. Flip, and using toothpick, prick top of burger to allow for steam escape. Allow burger to cook 3 to 4 minutes on this side. 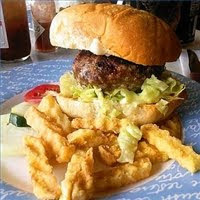 You MUST let the burger cool before eating. The cheese will be very hot and you will burn your mouth if you bite into it right away. Trust me, these are amazing. One thing to remember, though, is to use the cheese that the recipe calls for. I used Brick Cheese (because that is all I had!) and after the burger cools for a bit, the cheese wants to get firm and chewy. I'm going to make these again, soon, and I'll use the deli American cheese. But, since son and hubby LOVE cheese, I'll probably use more than the recipe calls for. What do you think?? Does it sound yummy to you?? Have a great Monday!! If it is sunny where you live, I hope you can get outside and enjoy it! Thanks for the link and how cute is that journal! And your son is so wonderful. I'm copying this one. Thank you for sharing. WOW!!! That looks and sounds AMAZING!!! We're going to have to try that this week! That Burger looks yummy. Can't wait to try your recipe.